It’s only a few days since I compiled my marathon roundup of green cars due in 2012, and already it’s out of date. Today brought news of two new and very significant cars that should arrive before this freshly unwrapped year is out. 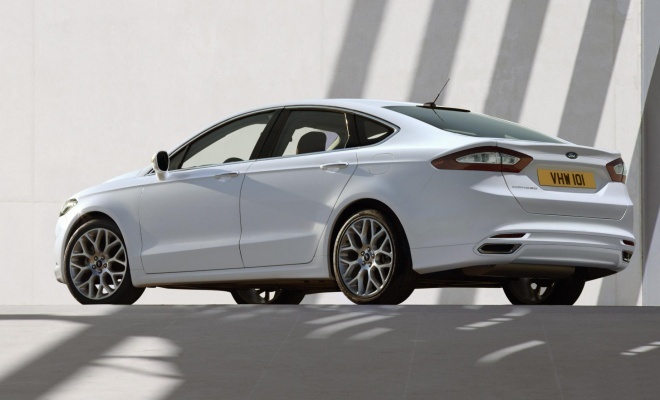 At the Detroit motor show this morning, Ford unveiled its new Fusion mid-size passenger car, which will arrive in Europe wearing Mondeo badges late this year or early next. At first glance the new car looks very similar to the current Mondeo, but direct comparison reveals more shapely sculpted sides, door-mounted mirrors, a more prominent shoulder crease that runs all the way forward to the slimmer headlamps, and a new nose that owes a heavy debt to Aston Martin. Daniel Craig did briefly drive a Mondeo in Casino Royale, before winning his signature DB5 at the card tables, but it seems a safe bet that nobody will mistake the new Ford for James Bond’s ride no matter what mask it wears. Of more interest to green motoring fans is the revelation that Ford aims to deliver class-leading economy from three different iterations of the US-market Fusion. A 1.6-litre EcoBoost engine, already available in Europe, will be offered in the new US market car. 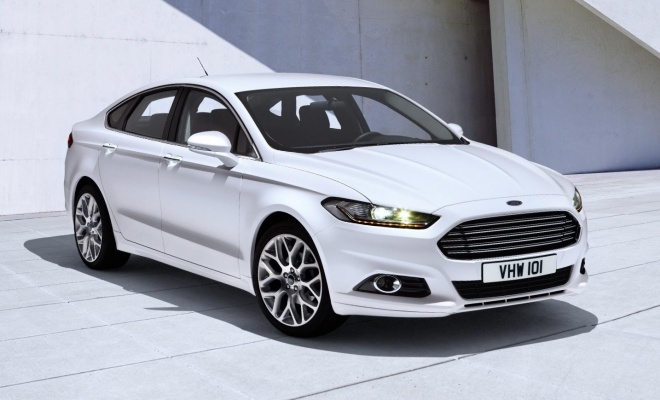 With stop-start, direct injection, turbocharging and variable valve timing, the 157bhp EcoBoost achieves a 149g/km score in the current Mondeo. No doubt the new Mondeo will nudge the needle a little further into the green. The US market will also get a hybrid and a plug-in edition of the Fusion, but there has been no announcement about whether either will be sold in Europe. The Fusion Hybrid will feature a new 2.0-litre, Atkinson-cycle four-cylinder petrol engine, and will be able to run at up to 62mph on its lithium-ion batteries. Ford says it will beat US-market Toyota and Hyundai hybrid saloons for economy. And finally the Fusion Energi plug-in hybrid is scheduled to arrive in the autumn, with Ford promising to trump the miles per gallon offered by both the Toyota Prius plug-in and the Chevrolet Volt. Meanwhile, Mercedes-Benz has revealed its riposte to BMW’s upcoming ActiveHybrid 5 in the shape of a new hybrid E-Class. But while the hybrid 5-Series will put pace firmly before frugality, the Mercedes will follow a more economical blueprint. 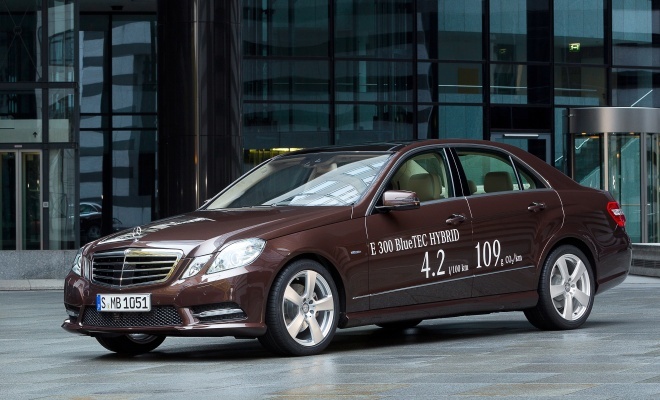 Available as both a saloon and an estate, the E300 BlueTec Hybrid will record 67.2mpg and 109g/km of CO2 on the combined cycle test – trouncing the expected 149g/km of the hybrid 5-Series. But while the Merc will get to 62mph in a brisk 7.5 seconds, it won’t trouble the Beemer’s 5.9-second sprint. The new E300 will join the growing throng of diesel-based hybrids, its 27bhp (20kW) electric motor joining forces with a 204bhp, 2.1-litre four-cylinder turbodiesel. Torque will not be in short supply, with 500Nm available from the engine room alongside another 250Nm on tap from the motor. The motor is installed between the E300’s engine and its seven-speed automatic transmission, sitting aft of a wet clutch that has ousted the usual torque converter. Separating the motor and engine with a software-operated clutch allows the motor to propel the car unaided while the engine switches off. Despite the clutch, the hybrid will remain a two-pedal car. As well as helping to accelerate the car more efficiently from a standstill, the isolated electric motor can also waft the car along at speeds of up to 99mph in so-called “sailing” mode – holding a cruising speed that has been reached through the efforts of the engine. This will allow the diesel unit to periodically switch off for as long as the battery reserves hold out (which won’t be very long at 99mph). In urban electric-vehicle mode, the car can manage about one kilometre at up to 22mph before the engine fires up. The hybrid’s lithium-ion battery can amass up to 0.8kWh of energy, captured through braking energy regeneration. 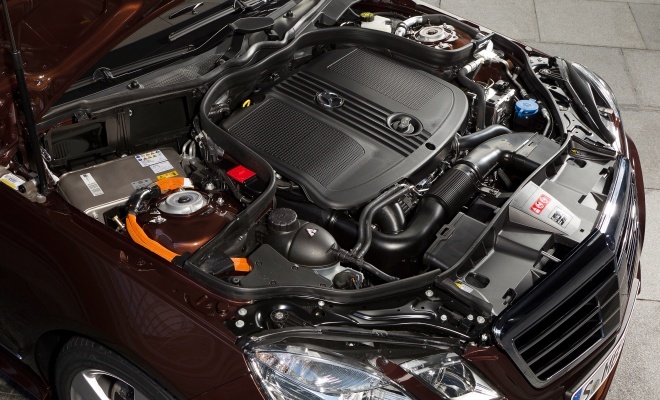 Unusually, the hybrid system’s high-voltage battery has been squeezed under the bonnet and has supplanted the usual 12-volt lead-acid lump. As a result, luggage volumes remain unchanged at the rear. While the hybrid’s packaging penalty has been kept in check, it’s doubtful that the same conjuring has been achieved on price. There has been no word yet on likely costs – no doubt we will find out when the E300 hybrid goes on sale before the end of the year.